Bharti Airtel is a bit of an enigmatic company. Emerging from humble origins, it has risen rapidly in the last decade to be today the largest telecom company in India by subscribers, revenues and profitability. Leaving in its wake the famed business houses of India. It is #7 in India in market cap. 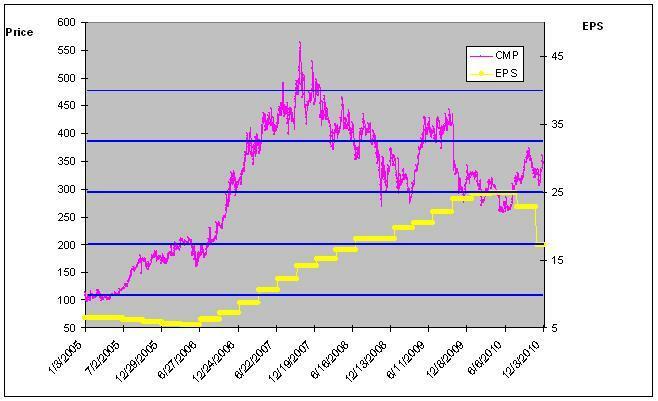 I first entered this stock in 2004; at this time, the stock was trading at a P/E of about 100. The market price was about Rs 161, and had risen from about 22 a few years before. Pretty soon, the price fell 15%. I held on, thought about it, and then bought some more shares. 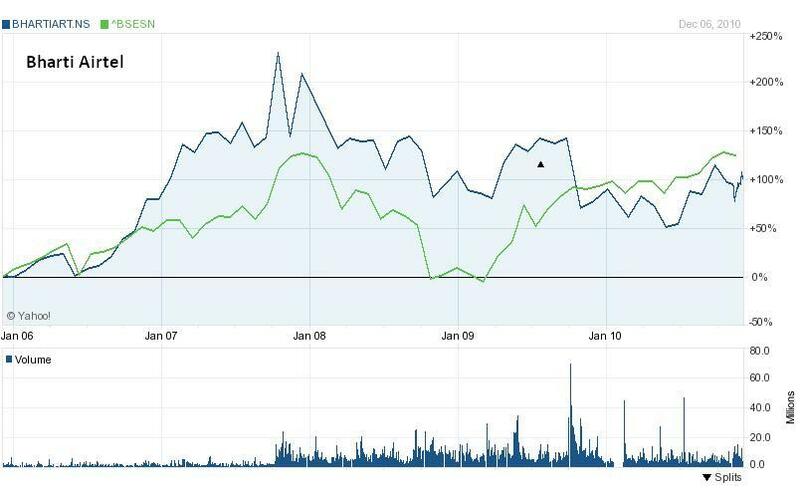 Fig 1 – In the last 1.5 years Airtel has under performed. This will change in the next two quarters. Like many new industries, the mobile Telecom industry has emerged from chaos. Even today, the DoT, TRAI and Ministry of Telecom have brought to this sector little clarity, poor governance and transparency. Even so, today at least it is better regulated than 7-8 years ago. In these circumstances, the story of Bharti Airtel is impressive. More than good vendors, what was commendable was the engagement model with these vendors. All were hired on a SLA based revenue model, where earnings were proportional to number of subscribers and performance against SLAs. At one stroke the Enterprise – Vendor relationship changed from a tug-of war based on negotiation to one of win-win with aligned objectives. These deals in the early 2000s were admired worldwide for their superior structure. Airtel has added several business to its portfolio and now provides Mobile, Telemedia (broadband, IPTV and fixed line), Enterprise (end to end telecom services) and Digital TV (DTH) services – all high growth businesses related to mobile phone services. When the next technology was introduced – 3G, Airtel was ready and won the largest number of circles in the very expensive auction. In the 2007 – 10 period Airtel executed on a strategy to grow overseas. It has successfully launched operations in Bangladesh, Sri Lanka, (through the Zain acquisition), in Africa, totally 19 countries. 2. Airtel paid too much for 3G in the auction, and this will also hit performance Airtel paid Rs 15,609 crores to get 3G licenses in 13 circles. However, this gives Airtel access to lucrative markets such as Delhi, Mumbai, Andhra Pradesh, Karnataka and Tamil Nadu. This covers 5 of the top 6 cities of India. 3. Airtel has spread itself thin outside India in Africa and 3-4 Asian countries, this is a recipe for disasterFig 2 – Net Cash from operations has shown a steady and substantial growth In India, the penetration is crossed 50% and growth in subscribers will slow. Investments required in networks too have been made. This market is expected to grow now in terms of ARPU as consumers become affluent. 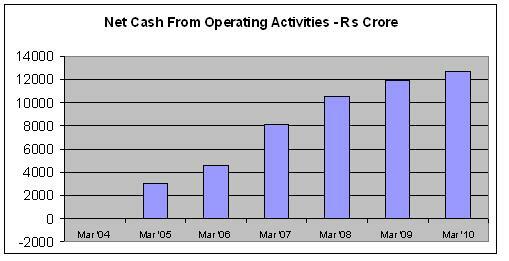 Cash flow from operations is expected to increase rapidly, see Fig 2belowAirtel realized that it can now look at new markets, and roll out it’s successful Indian model elsewhere. The most logical market is Africa where mobile penetration is far less than India, and characteristics show that Airtel can develop this market and reap long-term dividends.Bangladesh and Sri Lanka are small markets, but similar to India, and Airtel found entry opportunities here also. In fact the management of Airtel has found new challenges in these new markets after stabilizing the Indian operations. 4. There is too high competition in India, and telecom companies here including Airtel are doomed to subpar performance for many years While there are 12-14 players in the current Indian telecom market, it is expected that this number will reduce over the next 1-2 years. This is due to a combination of heavy initial investment required for network rollout and severe pricing pressure due to competition. Inevitably the viability of the market has reduced and newer players have been unable to justify additional investments.This will be positive for Airtel also as it may snap up some of these players, and certainly will soon face less competition in this market. 5. Just when people were getting convinced about Airtel, the share price plummeted in 2008-9 and it is now a poor stock The stock market recognized the high competition scenario and slowing growth characteristics. 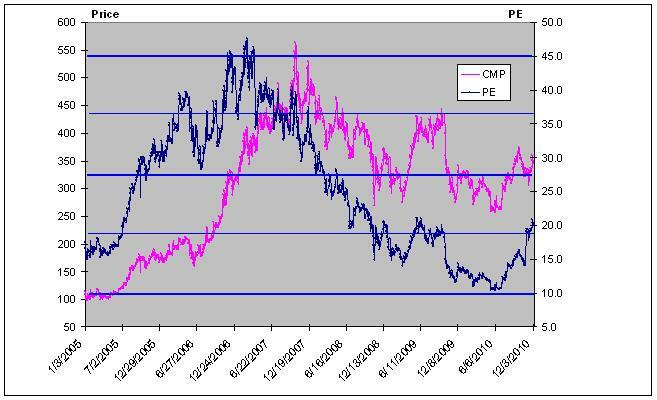 Hence the high P/E that players got earlier were reduced sharply and the market prices fell – for all telecom. However, see Fig 3, the EPS growth of Airtel has remained stable. 6. The Telecom sector in India is under a cloud due to regulatory problems, scams, etc. This is expected to clear up soon due to high visibility from media and political parties. In fact with valuations low and uncertainty high, it is a good time to look at an investment in Airtel. Fig 3: Steady increase in Airtel EPS over last 5 years. EPS is Expected to stabilize now in 2 quarters and grow again. As the 5th largest telecom company globally, Airtel is poised in the next 5 years to explode in terms of revenue, profits and subscriber numbers, eventually encircling the current global leaders. My opinion of Bharti is that it is a fantastic company, run by some of the best and experienced telecom businessmen. They have succeeded in the Indian environment, and will not just continue on this path here, but will also translate this experience to new geographies – of Asia and Africa. Hyper-competition in India has resulted in a temporary blip in performance of the industry. This is created by poor regulation and governmental interference. In spite of these circumstances, Airtel has maintained a good revenue and profit performance, keeping an efficient organization, investing in required capital equipment and riding though this rough patch. MNC telecoms with deep pockets have not been able to overtake Airtel, which is staying ahead. Rapid yet steady increase in cash flow will be used to both lower debt levels and invest in African markets, which will increase profits. Also Airtel is the only telecom firm in India paying dividends. 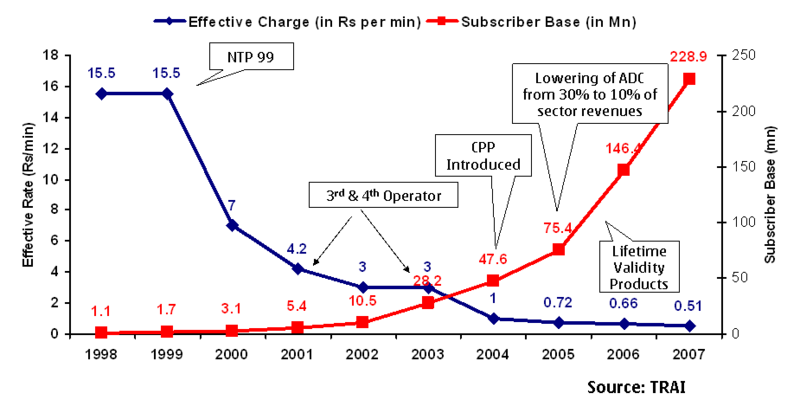 Fig 5 – Airtel’s PE is far lower than the average over the last 5 years. It will return to 25-30 levels. As an investor, I would say, this 1-2 year period is the opportunity to buy, for outsized returns over the next decade. In 2 years the telecom sector will recapture investor interest and Airtel will reach my price target of 800. Basis for projection: (1) stabilization of African operations (2) consolidation in number of Indian telecom players from current 14 to 8-10 leading to reduction in pricing pressures (3) successful 3G launch in 5 of India’s top 6 cities plus partnerships in others; and (4) Launch of number portability will see customers gains for Airtel (5) These will result in growth in market share for Airtel (6) Likely clarity in Indian telecom industry governance and regulation in 8-12 months, with Airtel generally benefiting. What software is being used to draw up the charts/graphs?